01 Jul Yin Yoga or Yang Yoga? Yin and Yang are two opposing energies, working together to create perfect harmony. So what does this mean for Yin Yoga? In an ideal world, we would have a balance of introversion and extroversion. Or as the saying goes, we would have our feet on the earth but head in the clouds. We would be in the world but unaffected by the world, like a lotus that grows in the mud but is unaffected by the mud in its growth. Yin Yoga is a practice that has been around for millennia yet has only started to be understood and practiced properly within the last decade. Yin Yoga, at its core, is just another name for a hatha yoga practice. What makes Yin Yoga different is an intention to target Yin tissue (ligament, and fascia or connective tissue). Yang style yoga focuses on dynamic muscle stretching and strengthening postures, which maintain healthy muscle function, flexibility and strength. In a typical Yin Yoga class, there is very little alignment given, just some simple instructions to ensure that no force or effort is applied. Without force or effort, the muscles in the target area can be relaxed in order to stress, not stretch, the connective tissue. With very little instruction required and each pose being held from anywhere between 3-15minutes, we typically find more space to dive into doing a Yin Yoga class. This space can be utilized to enter a meditative state where the senses are withdrawn and we have an inner body experience. It is from here that we can start to inquire, “Who am I? Where did I come from?” and so on. For the Type A or typically yang and extroverted character, a Yin Yoga class could be extremely frustrating, leading to fidgeting or engagement of muscle which the yang types need to achieve. Unfortunately, this would affect the quality of the practice and one might miss out on the numerous benefits gained when stressing Yin tissue in a moderate and controlled way. My theory is that in yoga, no force is the key, except to get onto your mat. Force yourself to practice often, especially in the style that you resist most, because this is often what we truly need for our bodies, and minds. As we age, adding more Yin Yoga to our practice seems like a natural, safe and healthy progression. But do keep up the Yang whilst you can! Don’t be too imbalanced – not too introverted, nor extroverted. Find a happy medium. Keen to learn a little more about Yin Yoga? Join me in Sri Lanka this August and balance out your energies at our immersive Yin Yoga retreat. Whether you’re keen to teach this practice of stillness or just expand your knowledge, this one-week experience will help you relax, go deep, tune in and learn. 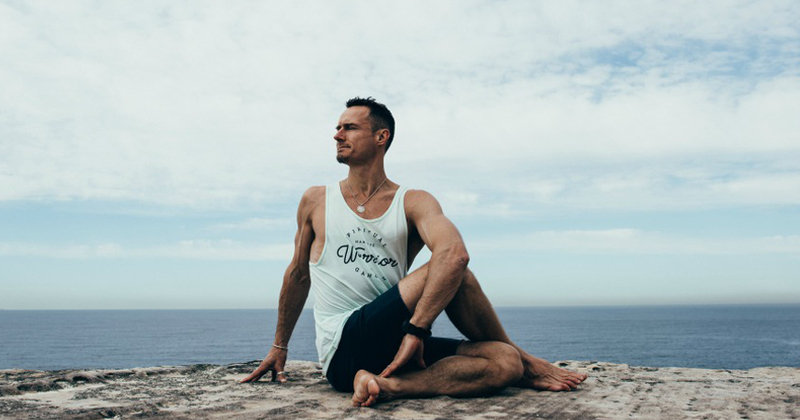 Keenan is Power Livings resident traditional Yogi who fuses an authentic understanding of Bhakti Yoga with the modern day flavour of Power Living. Keenan has committed himself to studying a range of yoga styles and has qualifications including Baron Baptiste Levels 1 and 2 and Paul Grilley Level 2. He has travelled the world studying yoga under many of the world’s greatest teachers and Swamis, including His Holiness Swami Durgand Swaraswatie in Rishikesh and 14 months in the immediate presence of Bhagavan Sri Sathya Sai Baba. Keenan has studied at SVYASA Vivekananda Ashram Bangalore, Bihar School of Yoga, Astanga Vinyasa at Mysore. After 15 years of practice Keenan believes that he is really only a beginner but being passionate about what he has gained from the practice chooses to share all that he can with those open to learn from him. Keenan teaches from a depth of traditional experience that ensures every class is deeply connected, spiritually powerful and uniquely delivered with love and warmth for all. Keenan’s love for life and all beings in it, his sense of natural joy and appreciation of life creates a space that is fertile for growth.